This recipe has been one I’ve used for years and like many, I no longer have any idea where it originally came from. A friend at some point in time wrote the ingredients and directions on a card and I found it when going through a shopping bag of newspaper clippings and more that I discovered tucked away in my closet when I was moving. That brown paper bag is filled with some favorites and I plan to resurrect them as I can. Included is a recipe for Beef Wellington that I made once for a dinner party; that dish took me three days to complete and I will never forget that I wanted to sob when there was not one bite left after our guests left. Oh I was pleased they loved it too but I so wanted just one more bite. Guess I do need to make it again don’t I? I made this to serve with the Apple Butter I made last week and the Pumpkin Butter I’m posting tomorrow. It is just perfect. Perfect for me is a bread that is chock full of chopped apples and toasted walnuts. Those toasted walnuts were my only revision to this old girl; that’s just what I do now and I love the difference it seems to make in every recipe. Who knew I just didn’t care for ‘raw’ walnuts? Toasted I love! This is the perfect time of year for this bread; apples in all colors and sizes are available. I like the ones that are not as tart as Granny Smith but still hold up during baking and don’t turn to mush. I will use Gala, Jonagold or Honey Crisp or a combination of all three. Of note? I don’t peel these either. Trust me you don’t need to! I’m going to start a cause and would love to see all people who previously thought apples had to be peeled unite. Want to join us? All you have to do is make this bread and leave the peels on and you’re in! Seriously the best and so easy too; you really do have to make some! Preheat oven to 350° In a large bowl, whisk the first six ingredients. In another bowl, whisk eggs, oil and vanilla until blended. Add to flour mixture; stir just until moistened (batter will be thick). Fold in apples and walnuts. Put mixture into two greased 8x4-in. loaf pans. Bake for 50-55 minutes or until a toothpick inserted in center comes out clean. Cool in pans 10 minutes before removing to wire racks to cool completely. Finally made these today! The house smells divine! patiently waiting for them to cool….. This is a beautiful bread but that shot with the apple butter on it screams dessert to me. I look forward to your brown bag of treasures coming out on your blog. I could go for a slice of this apple bread. It’s perfect with the Apple Butter on top! Pinning to try later. Just the recipe I was looking for this Season! 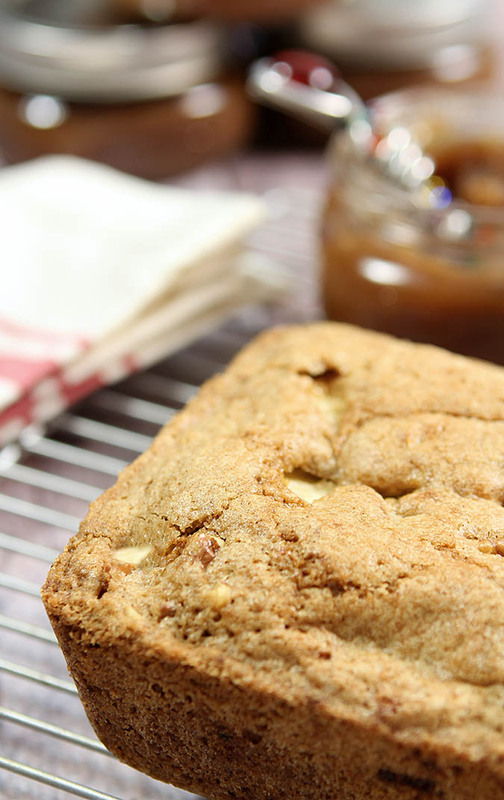 I could go for a slice right about now with that gorgeous Apple Butter! I think the “A” in Autumn should stand for apple! I love this time of year. 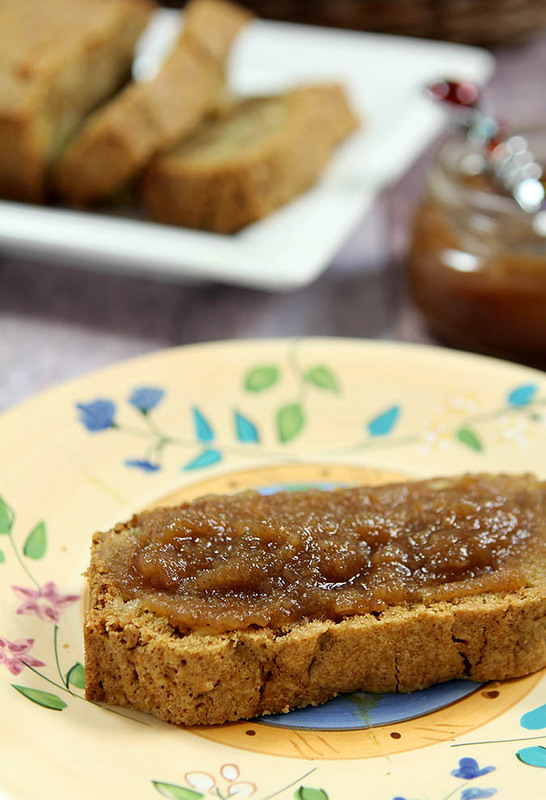 Your bread is a perfect offering fo the season and that apple butter looks amazing! I have a whole bunch of recipes on little note cards and scraps of paper that I really need to go through one of these days. There’s some gold in there. And speaking of golden, this dish is golden — both in its great good looks and its flavor. Well, I’m guessing at its flavor, but the recipe reads really good! 😉 Thanks for this. No peeling? It is worth a try and I’ll see how it goes. I do love setting up my apple peeler on the counter and letting my son crank the apples through. He thinks it is great when the peel is cut off and the apple results in a spiral. But what a mess that is to clean up! I also have a few recipes that have been in my recipe box (yes, actually handwritten on cards!) for years and I love to get those out and make them again. It’s like a visit with an old friend. 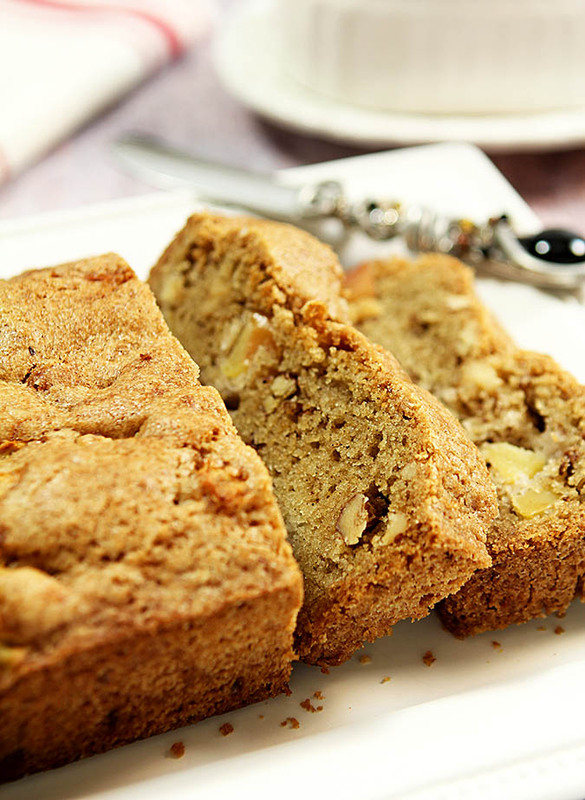 This apple and walnut bread sounds like the perfect vehicle for that lovely apple butter! I can’t imagine a more perfect combination. The funny thing too is that even though I do a post about the recipe and often take a photo of the almost hard to read card…I still can’t pitch the cards! There was something more meaningful about those handwritten efforts wasn’t there? Not all change is good; it just seems like so many things are looked at as ‘old’ when I think losing all of the ‘old’ is not all good.